In 1976, a crudely published fanzine devoted to the experimental film scene made its debut. 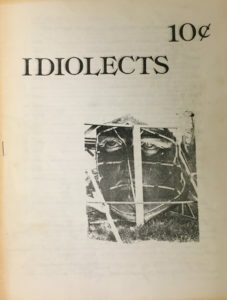 It was called Idiolects and the first issue offered a definition of its name: “An idiolect is the language of an individual at a particular time.” That definition certainly could be applied to both the filmmakers covered in the zine and to the writers who contributed articles. Although not an official publication of New York City’s Collective for Living Cinema screening society, Idiolects was closely tied to the organization, offering a “temporary” publication address of 52 White Street, New York, 10013 in the indicia. That was the Collective’s then permanent screening space in 1976 after having bopped around Manhattan for several years prior. In addition, the Living Cinema was formed in the early 1970s by students who had studied filmmaking at Binghamton University in upstate New York and then moved to New York City. While Idiolects #1 gives no clear main editorial voice, it names a trio of “Production Coordinators” in the indicia. That trio consisted of Steve Anker, Lee Krugman and John Maliga — all of whom also studied at Binghamton in the ’70s. While Anker did study filmmaking, he has since become more well-known as a program director and writer; having served as the director of the San Francisco Cinematheque for many years and co-writing Radical Light: Alternative Film and Video in the San Francisco Bay Area, 1945–2000 among numerous other achievements. Lee Krugman has several films in the Film-Makers Cooperative catalog, made between 1974 and 1982 — all are in either standard 8mm and Super 8mm film. Most recently, Krugman has helmed Krugman Associates, a film sales and consulting company in Westchester, New York. Maliga’s credits in film seem limited, but he is credited as performing in Air of Inconsequence (1977), a 3-D shadow play performance by Ken Jacobs. Also credited in the indicia is Becky Abbott, who is thanked for her “typing assistance.” This is Rebecca L. Abbott, who — although she did not attend Binghamton — has continued to make films since the ’70s and is currently a film and media professor at Quinnipiac University. Abbott originally studied sculpture and painting, but became interested in experimental film through Raymond Foery, who introduced her to the work of Bruce Baillie, Maya Deren, Hollis Frampton and others. Later, in 1978, while Abbott was earning her MFA in filmmaking at the School of the Art Institute of Chicago, she roomed with Phil Weisman, one of the founders of the Collective, and Nora Jacobson. Abbott became involved in Idiolects through Foery, who contributed two articles to the first issue. Foery is also currently a film and media professor at Quinnipiac University with Abbott; and is most noted for his writings on the films of Alfred Hitchcock and Francis Ford Coppola. Krugman and Anker also contributed articles, but Maliga and Abbott did not. Two of the most recognizable contributors are Amy Taubin and J. Hoberman. Both writers have been very close to underground cinema. Taubin appears briefly in Michael Snow’s Wavelength; and she inadvertently gave Nick Zedd the inspiration to name the “Cinema of Transgression” movement after describing his film They Eat Scum as “transgressive” in a review. Hoberman co-wrote the book Midnight Movies that includes a chapter on the underground; and has been one of the most devoted champions of Jack Smith‘s Flaming Creatures. Their full list of avant-garde and experimental film writing credits are too long to get into in this article. This first issue of Idiolects offers a vivid portrait of the vibrant experimental film screening scene in New York City of the late 1970s. Rebecca Abbott has said that she moved to NYC in 1975 partly to be able to see films at the Anthology Film Archives and the Collective of the Living Cinema. In addition to those two institutions, fans of avant-garde cinema could regularly see shows at the Millennium Film Workshop, the Whitney Museum and other places. In the early part of 1976, there were screenings by “old masters” like Stan Brakhage and Ken Jacobs; new work by George Landow (who hadn’t changed his name to Owen Land yet), Ernie Gehr, and Warren Sonbert; as well as films by up and coming filmmakers like James Benning and Bette Gordon. Most of these filmmakers were (and are) tied to the New York City filmmaking scene, but one of Hoberman’s articles is on work by a Los Angeles-based filmmaking collective known as Telethon. Below is an index to the contents of Idiolects #1. The only image in the entire zine is on the cover, which the Underground Film Journal is unable to identify. None of the inside pages have film stills nor filmmaker portraits. It is all just type-written text. Lastly, the final article — an interview with performance artist Stuart Sherman — concludes on the zine’s back cover and with the phrase “End of Part One.” It is unclear if the “Part One” refers to the interview or the zine. There is no “Part Two” in issue #2, as we’ll see in the next article. George Landow, “Remedial Reading Comprehension,” “New Improved Institutional Quality…“, “Wide Angle Saxon“, “No Sir, Orison“, etc. About “History by Ernie Gehr,” impressions after the first viewing. Read about the second issue here.